My very first class in seminary was New Testament 1. In terms of favorable conditions, the class had everything stacked against it: it met on Monday mornings…at 8:00 am…in a basement classroom at North Park Seminary. But there was one redeeming factor…the professor: a kind, brilliant scholar named Klyne Snodgrass. Dr. Snodgrass moved us through the gospels with wisdom and grace. The only book he ever brought to class was a Greek New Testament, from which he would read out loud, translating as he went. We were all mesmerized. He redeemed every Monday morning alarm. 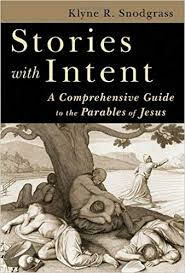 Every once in a while, Dr. Snodgrass would mention a book he was working on, something about the parables of Jesus. Little did we know that this work, published in 2008, would become the leading authority on the parables. Coming in at just over 900 pages, Stories with Intent, now in its 10th anniversary edition, is a masterpiece. And yet in spite of all its exhaustive and technical scholarship, it reads as though a kind professor is simply relaying beautiful truths about the parables to his New Testament class. Centuries after Jesus told these stories about simple things: seeds, wheat, oil, animals, and even sons…we are still trying to unpack them. We know they are more than merely stories. They have a meaning and depth that sometimes leaves the hearer with more questions than answers. The parables we will consider the next few weeks are not the ‘easy’ ones. They include words such as kingdom, judgment, weeping, and darkness. They will leave us shaking our heads and furrowing our brows. This is a tall order for these not-so-tall tales. But as Klyne would tell us seminary students, and as he tells each one of us, “Identities formed by the parables lead to people who understand grace and its demands and take it seriously enough to respond.” The response is our call to action. One of the ways we respond is engaging the text together. The “Parablog” is a space to do just that: reflect, converse, and question together. It is our hope that you will be drawn deeper into the parables this season, and drawn out into the world to love and serve in the name of the great storyteller.